With white XR-5 as a secondary containment liner this state-of-the-art facility - The largest defense fuel terminal on the US West Coast - made history as the first fuel facility ever to achieve LEED certification. 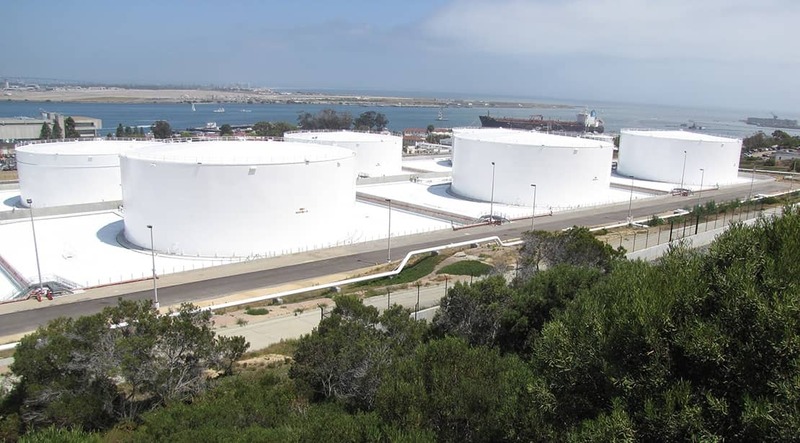 Defense Fuel Support Point (DFSP) Point Loma in San Diego, California is the largest defense fuel terminal on the West Coast. Built between 1917 and 1954, the station has the capacity to store one million barrels (42 million gallons) of jet and diesel fuel. The site services significant clientele. The US Navy fleet, the US Marine Corps Air Station Miramar, the 11th District of the US Coast Guard/Homeland Security, the National Oceanographic and Atmospheric Administration (NOAA), and the Military Sealift Command (MSC) all fill their tanks at Point Loma. Situated alongside San Diego Harbor, the 100 year-old facility is surrounded by water and high-end homes. The site is highly visible, and visited often. In 2003, the various commands using the site had consumed more than 460 million gallons of fuel and oil. The original facility accommodated 54 storage tanks, including both Aboveground Storage Tanks (ASTs) and Underground Storage Tanks (USTs). Constructed with riveted seams, these tanks began suffering leaks at the seams at varying rates as they aged. The DFSP command had to extract fuel and contaminated water from site soils on an ongoing basis. When 1.5 million gallons of fuel spilled from the site in 2006, authorities had no choice but to replace the tanks. In 2008, the Defense Logistics Agency (DLA) committed $195 million to modernize the facility under Military Construction (MILCON) project P-401. The largest construction project ever in DLA history, its goal was to replace the existing infrastructure and facilities with modern alternatives to meet the growing demands of the supported groups for the next century. Administrators also wanted the project design to incorporate sustainable operational practices, and to quality for accreditation from the US Green Building Council (USGBC) for Leadership in Energy and Environmental Design (LEED) status. In a construction project that lasted five years, crews demolished much of the old site and prepared it for upgraded, more environmentally sound facilities. They built eight new 125,000 barrel ASTs, replacing 75% of the existing 54 ASTs and USTs at the site. In only eight tanks, the site offered the same 100 million barrel storage capacity of fuel and marine diesel fuels. To give these barrels secondary containment protection, the project design team selected flexible membrane liners in place of concrete. To cover the ground beneath each tank, authorities selected a tan, nylon-based 40-mil polyurethane-coated flexible membrane liner (FML) by Seaman Corporation. Chosen for its excellent abrasion resistance, broad hydrocarbon chemical resistance and unmatched puncture resistance, the advantages of this FML over concrete are numerous. Primarily, they include: lower cost, rapid installation and reduced maintenance. To line the dike area around the tanks, authorities chose Seaman Corporation’s 30-mil XR-5® fuel resistant, polyester reinforced Ethylene Interpolymer Alloy (EIA) geomembrane. In addition to being UV resistant, XR-5 also provides the advantage of having a low coefficient of thermal expansion. This reduces the probability of the liner failure due to environmental stress cracking caused by repeated expansion and contraction. It also minimizes trip hazards to maintenance personnel otherwise posed by the extreme wrinkling that can occur in geomembranes subject to thermal expansion. Additional product benefits include: ease of installation; ease of maintenance, inspection and repair; cost effectiveness; and, proven long life. To meet LEED requirements, Seaman Corporation manufactured the dike liner fabric in white. White lowers the membrane’s Solar Reflectance Index (SRI) to below 29, which is the maximum SRI value allowed by LEED’s “Heat Island Effect, Noon-Roof” credit requirement. It also lowers the surface temperature of the membrane in summer months by 30 degrees Fahrenheit, a real bonus for crews maintaining the site. The DLA completed the project on time in January of 2014. In June of the same year, this state-of-the-art facility became the first fuel facility ever to achieve LEED certification. Making history as the DLA’s largest new fuel facility replacing a pre-World War II fuel storage facility, the site is a show piece for the US Navy. Prime Contractors: Nova Group, Inc. and Underground Construction, Inc.